Did you hear I’m having a sale in my Etsy shop in honour of Earth Day? I am offering 15% off of everything in my shop. The coupon code is EARTHDAY15. You can pick up a beautiful summer scarf made out of banana fibre which is an eco-friendly option because it is a completely renewable resource. The original price is $70, the sale price is $58.75! You can also view my creations made out of recycled sari silk which are eco-friendly because they prevent all of the exceess silk in sari factories from going to landfills! Summer Scarf in the Top 10 Accessories! 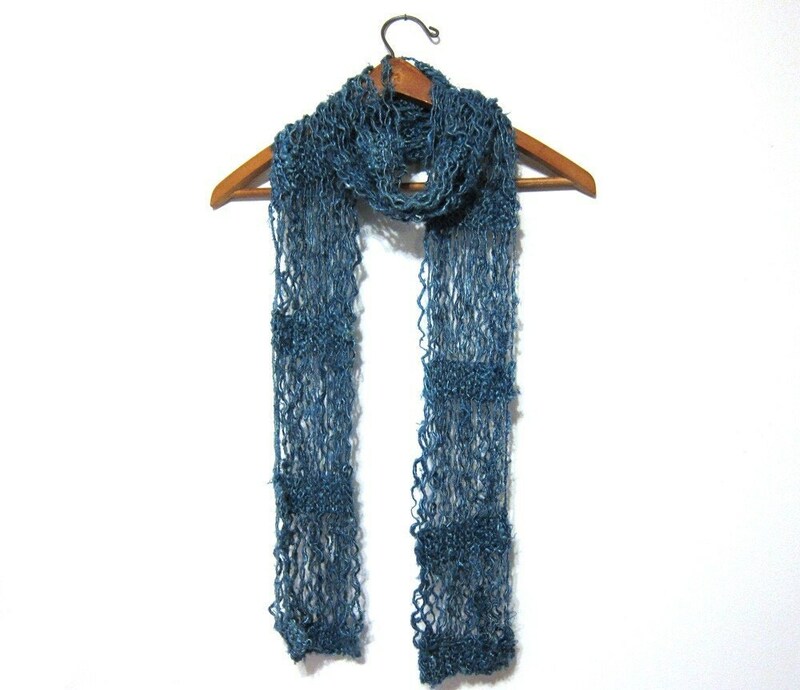 I entered my summer scarf in the Accessories list on Handmade Top 10 which is a site where you can rate etsy items. My scarf was the #9 accessory out of 123 items! Please meet Sarah-Maria of the eco-friendly clothing shop, meerwiibli on Etsy. She is a talented designer who opened shop on January 1st of last year! If you would like to learn more about her, check out her facebook page or her website. I’m a fashion designer/seamstress/photo researcher who lives in the Catskills but grew up in Switzerland. That makes my clothing Swiss made in the USA! What makes your clothing eco-friendly? Well, we all create waste and even making clothing from environmentally responsible fabric creates pollution and waste but it also creates jobs. I love using bamboo knits. Bamboo is an amazing fiber which is also super-soft, draws moisture away from the skin and it’s naturally antimicrobial. I also use organic cotton and most of my fabrics are made in the USA or Western Europe, where there is a high anti-pollution standards for manufacturing. How did you get started in the world of crafting/design? I grew up in Switzerland, handicrafts are quite important there and I learned knitting, crocheting and sewing starting in 3rd grade in school. Your etsy shop is called meerwiibli, does this have any meaning to you? How did you choose the name? Meerwiibli means mermaid in Swiss-German. My family crest is a mermaid and I’ve always been completely obsessed with mermaids so it was quite an easy choice. Sadly I still spend most days at my day job. So my sewing time is between coming home and dinner and on the weekends. I end up working about 60 hour weeks between my day job and my shop but I love it. I’ll be trying to cut back hours at my day job soon though, yay! Beauty and nature. It’s all around us. Plus I have a serious fabric buying habit. I often buy the fabric first and design around it after I have the fabric, not the other way round. What is your favourite thing in your shop and why? I’m always a sucker for my coats and jackets and they seem to be my bestsellers usually. What I love about outerwear is that you can just put on a great jacket and the whole outfit is saved. If you could go back and give yourself advice on starting out on etsy, what would it be? I should have opened my shop much earlier than I did. I thought I needed items in stock and while it sure helps it’s not necessary. I had a hard time getting started because I just didn’t have the time to create stock. What are some of your favourite etsy shops? Fairysteps is making me a pair of vegan shoes, her work is amazing! I really want a piece by Leanimal of Project Runway fame, her work’s been hugely influential to me. I’d love to have one of WoodlandBelle’s terrarium rings and emiliefriday has made some amazing felted figures for me. Do you do any other types of crafts? Well, nothing as well as sewing though I’ve incorporated needle felting into my sewing before, love doing that. I used to be a doily-crocheting maniac in middle school…. Is there any craft you wish you knew how to do? Shoe-making! Oh my goodness I really need to get on that! I’m a shoe addict but also a vegetarian – not a good combination, it’s really hard to find awesome non-leather shoes that are cool and good quality. Zombies, pirates, ninjas, or vampires? I’m going to have to go with pirates as the Pirate School books, written by my husband Brian James, always crack me up! There are probably a lot of reasons why pictures are important, I am sure that I don`t even know hald of the reasons why. I do know that Google likes pictures. The one reason I can figure out is because you can link it to your shop listing and you can add alt tags and a title for Google to pick up. Whenever you have a blog post about your Etsy shop, it is visually important to have pictures for your readers to look at. When I make a link here in WordPress, it automatically defaults linking the picture to itself. Make sure that you change this and have the link point to your shop listing. If you click on my link below, you will see that I have it going directly to my fingerless gloves. You are also able to add words in your alt text. Make sure that you use the keywords that you’ve already selected for your item as well as a few other descriptive words. You need to make sure that the text will make sense to readers because they will see these words if the image doesn’t load up, or when they hover the mouse over the picture. Google uses the alt text when trying to determine what the picture is for the image search feature. Personally, if I am searching for something specific, I will use the Google image search for fast browsing. The alt text is also used in browsers for the visually impaired so please make sure that the text makes sense! The keywords I`ve chosen for the scarf above is summer scarf. 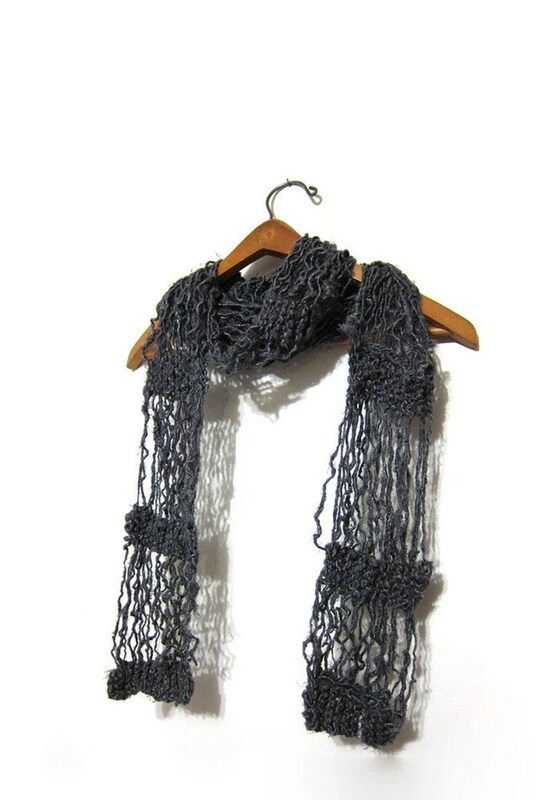 The Alt text that I`ve used is “Lightweight eco-friendly summer scarf“. So remember, pictures=backlinks. Alt text=keywords= Google image (and, as a result Google) search ranking increase. If you will notice, I took my own advice in my previous Beginner SEO posts and created many backlinks throughout this post! You’re now getting your shop name out there. How will people find out what you’re selling? By using carefully selected keywords. What are keywords? They are the words and phrases that you use to describe what you are selling. It is very important to make sure that you use keywords that people will search to find your shop. You can use the Google Keyword Tool to search potential keywords and see which ones are popular search terms in Google. I am not an expert in using this tool yet, but it is very easy to look up keywords and see how popular they are compared to other keywords. It also lists similar keywords. Using this tool, I looked up “fingerless gloves”, “fingerless mittens”, and “handwarmers”. I see that on average, fingerless gloves has on average 110,000 searches per month which is significantly more than the other 2 terms. From this, I know that the keyword to use for my fingerless gloves is indeed fingerless gloves. Now the important thing is to use this phrase as much as possible when describing my fingerless gloves. I need to make sure that each listing of my fingerless gloves has the term at the start of the title. Etsy takes the fist few words from your listing and puts them in the url for the listing. http://www.etsy.com/listing/70283068/fingerless-gloves-knit-handwarmers As you can see the first words in the title of this listing is : “fingerless gloves”. I’ve also made sure that the word “knit” is in there too. You also need to make sure that you use this term right near the start of describing your listing so Google picks it up in the description. Google can also search your shop sections so if you can, create a shop section for each of your keywords. Remember, there are a limited amount of shop sections so this isn’t always possible. The other place you need to make sure to use the keyword is in the clickable portion of links. 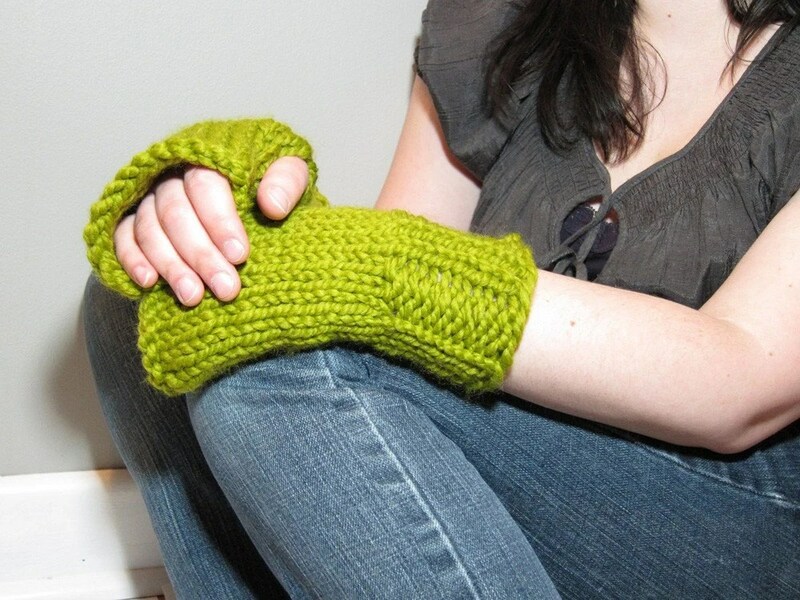 As you have noticed, I used the term fingerless gloves and linked it to my shop section. I could even link to hand knit fingerless gloves for good measure. When linking to a specific item, I tend to use a little bit more of a descriptive term. One example could be pink hand knit fingerless gloves. When making your links, make sure that you put the keywords in the link title as well. To increase my backlinks, I also make sure that I link back to the appropriate shop sections in each of my listings on Etsy as well. For instance, in each of my fingerless gloves, I link back to the fingerless gloves section. I have been ignoring the whole idea of SEO since I opened my Etsy shop. Bad idea. How can I expect to improve my shop views and sales if I don’t improve my google search ranking? Google, and other search engines, don’t know who you are from the other etsy sellers out there. You need to tell them that you are cool and that they need to know about you. You do this by ensuring the your shop is linked as much as possible so that they can find you. The more links they find, the more popular they think you are and the better your google ranking gets. How is this done? By leaving what is called backlinks. Backlinks are simply links to your etsy shop and the items you are selling. One very important thing to remember is that when you leave your shop link, remember to leave the long link http://www.etsy.com/shop/impossiblyalice instead of the shorter http://impossiblyalice.etsy.com. Feel free to use the shorter and easier to remember url on your printed material but always use the longer one when you leave a link on the internet. Why? Go to Etsy and click on your shop. You will see that the longer name is the actual url that etsy uses. It is much easier for Google to use and rank that url. Put a link back to your main shop on eachof your listings, in your policies, and in your profile. Link your shop on twitter, facebook, tumblr, pinterest, and any other site where you can leave links. Start a blog. Even if no one reads it, Google will find the links when you blog about your shop. Comment on blogs and use your shop url as your site that your comment links to. Google also likes these links to be posted in relevant content to what you are linking to. For example, if you are selling wedding related items, it is probably not in your best interest to leave links on pregnancy blogs. Having your own blog ensures that you are linking to relevant content. When putting links in your blog, Google also prefers you to use words that describe your link as the clickable part of the link. For instance, I can leave the following link: http://www.etsy.com/listing/67933045/spring-and-summer-scarf-handknit-from and Google will find my scarf and can figure out what it is but if I said “Check out my new eco-friendly spring scarf“, Google will know what I am linking to. It is also important to enter in the title for your link. If you hover over each of my links, you will see that I have described what the link is. There is a fine line between leaving links everywhere for Google to find and being spammy. Please make sure that you don’t alienate the humans you are trying to draw into your shop when leaving your links for google and other search engines. I’ve worked hard on making new and exciting listings for my Etsy shop. I’ve got some new spring colours of fingerless gloves and more to come in the next few days. These gloves are so soft and cozy, everyone who touches one immediately comments on how soft they are! They are perfect to wear in the spring for bike rides, for busy parents who need free fingers but want to keep their hands warm, and for people who love to use their iPhones, iPods, blackberries, etc. They are also awesome to wear when the weather starts getting warmer and they turn on the air conditioner in your office so your hands don’t freeze while you work on your computer! I’ve also listed new spring or summer scarves with more styles to come! 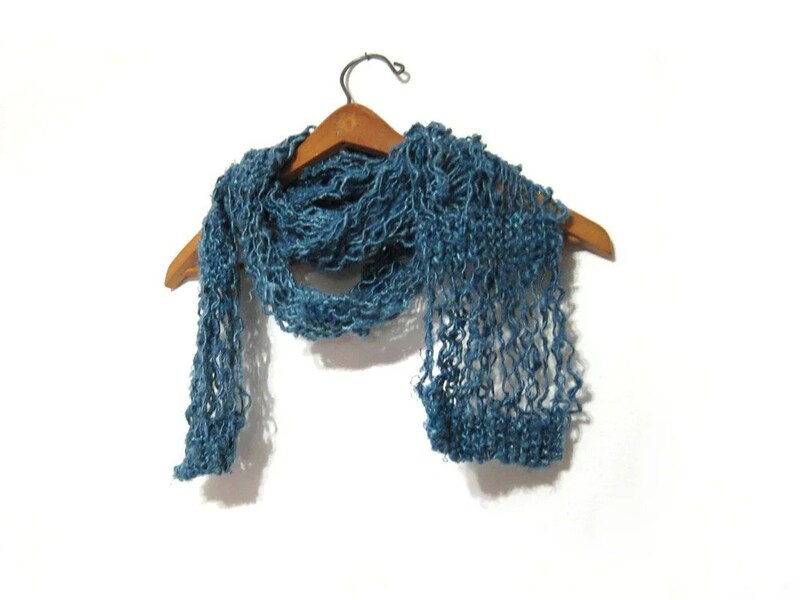 These scarves are made from fair trade handspun yarn from Nepal and India. 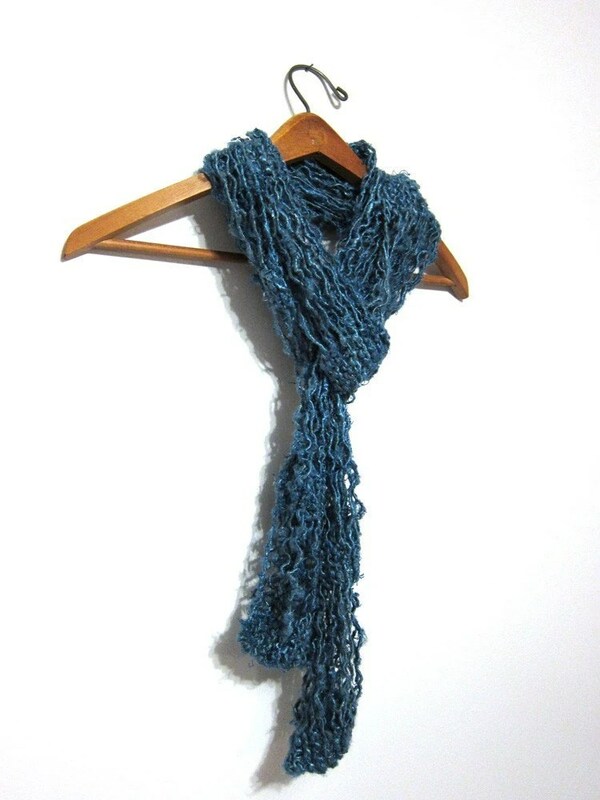 The banana fibre scarves are also vegan friendly and eco-friendly because it is made out of a renewable resource. Please read my first post on banana fibre. Despite the name, the recycled sari silk is made out of entirely new fabric. The recycled sari silk is scrap fabric left over from making saris. This means that these scarves are also eco-friendly because you are preventing this material from going to landfills. 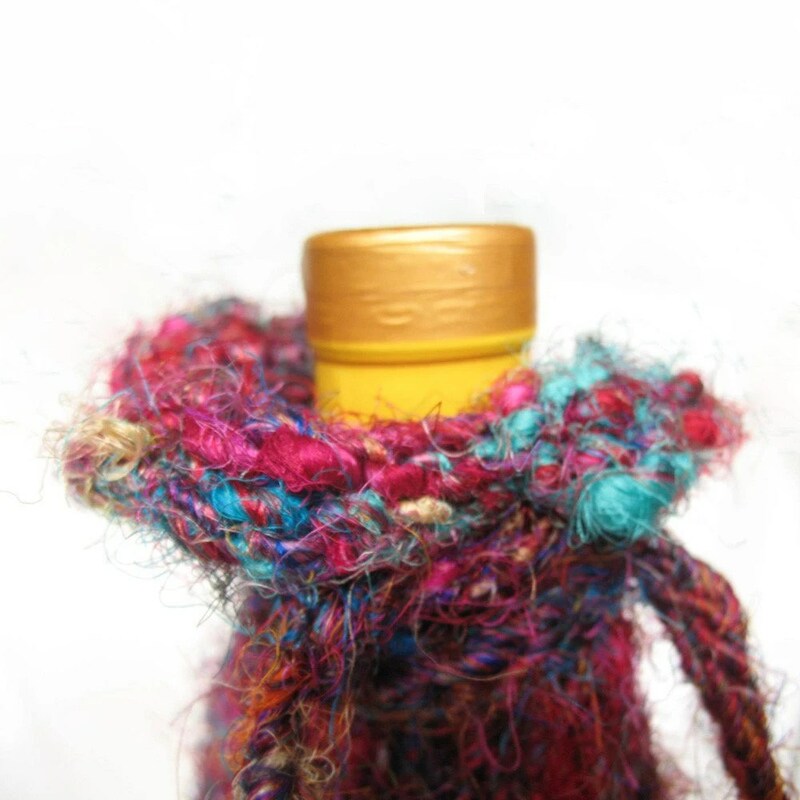 I’ve also fixed up the pictures for one of my favourite cowls in my shop. Not to pat myself on my own back too much, but one of my Etsy friends thought that it was a completely new listing! This cowl is so long that you can wrap it around your next 3 times when it’s cold outside. Because it is so stretchy and long, you can use your imagination and wear it any way you can think of! It would also be a perfect blanket like shawl to keep at the office in those cold air conditioning months! The biggest challenge I have as a knitter is to knit items that are not meant for fall and winter. I am excited to announce that I am working on some new designs for listings in my shop that are not season dependent! I hope that these new designs work out as great as I am envisioning them in my head so I can introduce them to you ASAP! I’ve also got my first set of business cards and they are so beautiful! I’d love to start sharing them with you! 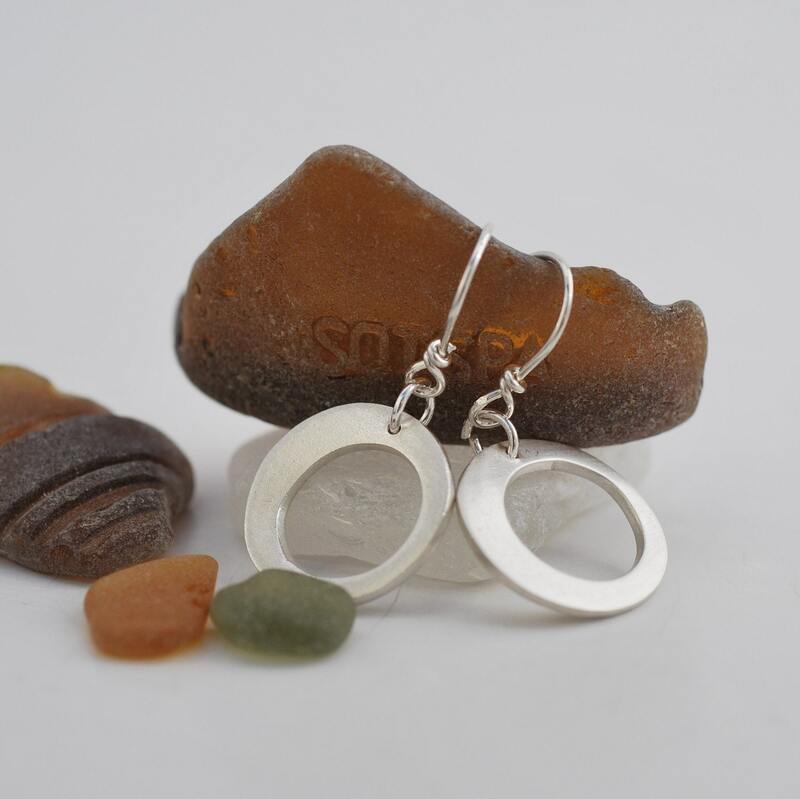 I’ve had the pleasure of meeting 2 wonderful and local jewelry designers. First on twitter, then in real life. They are Emily and Corina behind the beautiful jewelry line jake+cleo. What makes their shop special and unique is that their jewelry is eco-friendly. Please read this interview, like their facebook page, follow them on twitter, and read their blog. While you’re shopping, check out Emily’s other etsy shop, emms gems. We’re 2 girls with a shared passion for design. We met while working as kitchen designers and became fast friends. What makes your jewelry eco-friendly? We are excited to work with an eco-friendly medium like Art Clay silver, which is made with 100% recycled silver, water and an organic binder. Our design process is also environmentally responsible in that all scraps, shavings and dust are collected and reused in jake + cleo creations. How did you get started in the world of crafting? E: It’s in the family…or maybe it was as a Brownie. C: I enjoyed building models in design school, does that count? Your etsy shop is called jake + cleo, does this have any meaning to you? How did you choose the name? We wanted a catchy name that represented us as designers. There are 2 of us, we own cats named Jake and Cleo, we like modern design with a twist, masculine yet feminine. Plus, we thought it sounded better than Corina + Emily. E: I start just about every day with a bowl of Mini Wheats cereal and a glass of orange juice – NO PULP! But before that, Cleo the cat gets a good scratch behind the ears, and the other cat gets fed. C: Every day is a little bit different. That’s what is great about working from home. C: A deadline. I do my best work under pressure. E: Nothing beats a great pair of earrings. C: I love the Green Like Grass ring. 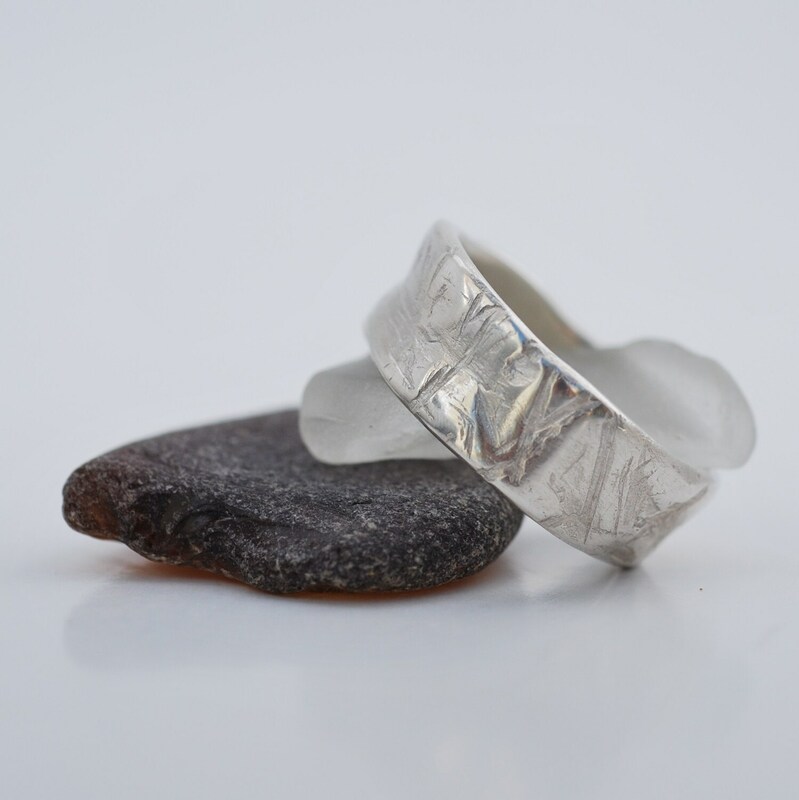 It’s my favourite thing because it was the first ring that we designed and it’s still a top seller. E: practice taking photos at ALL times of the year! C: I feel under-qualified to give people Etsy advice having only opened our shop in September 2010. But, have patience, it takes time to build relationships, followings and for buyers to find you. C: Emmsgems, definitely. I was Emily’s spokesperson/model before we started jake + cleo together. My latest favourite is Chrisssmith22, aka The Art of Zen…Crochet. Her latest crocheted ‘gypsy’ scarves are amazing. One Christmas we each made pencil crayon fabric roll-ups for our nieces. We SEWED them ourselves! C: I’m not so crafty. I sure would love to learn how to lay hardwood flooring. C: Yeah. Not so much. If you’d said werewolves…go team Jacob! I have a problem in my kitchen. It is a nice size but there are too many windows and doors and a poor layout so there isn’t much counter space. Taking up precious counter space for me is a rotating spice rack filled with many spices that came with it that I will likely never use. I am sure a lot of people struggle with the same thing in their kitchens. But there is a solution! Meet Katrina, of Salt City Spice on Etsy. She makes gorgeous magnetic spice racks which you can hang on your wall that are often upcycled from old pieces of metal. You can get a spice rack that is both gorgeous and functional! I’m married to my college sweetheart with a darling 13 month old daughter. I pretty much love everything related to food except, ironically, the word “foodie.” I’m a terrible liar and like to think I’m funny (my husband doesn’t always agree). I’ve always loved crafts – drawing, making doll clothes, and creating jewelry were favorite activities growing up. My mom encouraged me by supplying seemingly endless supplies like markers, fabric scraps, beads, kits, and even a knitting machine at one point! I wish I still had that in fact – I would use it to make bodyless sweaters. Wait, what do you mean they’re called arm warmers? Your etsy shop is called saltcityspice, does this have any meaning to you? How did you choose the name? I’m sure you’ve figured out the Spice part, haha. We moved to Syracuse, NY (aka, the Salt City) a few years ago and thought we’d be missing out on our favorite big city restaurants. We were pleasantly surprised to find out that Syracuse has its own small, but strong food scene and that people here are placing more and more emphasis on local products – I want to help support the Buy/Eat Local movement in any way I can, so I figured my shop name was a good place to start. I wake up at noon, put on something fabulous, read the paper while sipping a perpetually hot latte, then spend the rest of my day cooking something intricate for dinner. Ok, not really – I’m a stay-at-home mom so a typical day is a bit of a juggling act, but I love and appreciate every day I’m home with my daughter and wouldn’t have it any other way. I’m inspired by creative reuses of materials, either by salvaging what most would consider waste and turning it into something beautiful and functional, or upcycling an item into something more useful or relevant than the original piece. I’m constantly looking at things and wondering what else they could be with a little imagination. 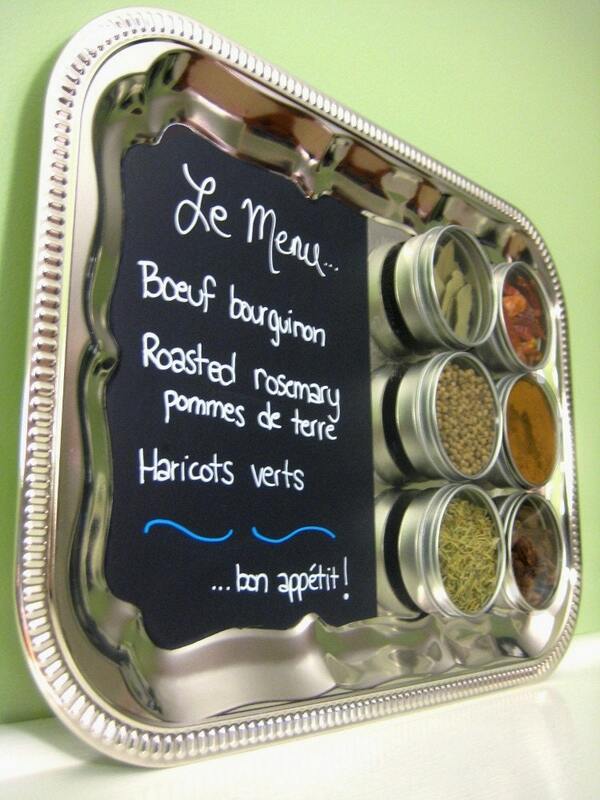 I had the idea to make a combo spice rack/chalkboard like this when I first opened up my shop but couldn’t get the materials quite right at first. As soon as this one was done, I immediately made another and put it in my own kitchen! Really treat it like a business right from the start – take your time to figure out your focus, put together a cohesive shop look, and get a business plan in place. Also, ask for help when you need it! There are people out there willing to give you honest, constructive advice if you just ask. Well, there’s this one shop that sells gorgeous hand-knit items called ImpossiblyAlice! Really, I have so many favorites – lately, the organizational junkie in me is loving the posters from Popchartlab and the functional art side of me loves the unexpected edible creations from andiespecialtysweets. Only for my own intents and purposes – I’m proud of having made most of the decorative items in my daughter’s nursery like her bedskirt, mobile, and wall art. If cooking counts as a craft then I do a lot of that too. I’d love to get my hands on a letterpress and do a little old-fashioned graphic design. I like the result of the words actually imprinted into the paper – it’s such a lost art form. Please visit her blog, follow her on twitter, and most importantly, visit her etsy shop and buy a spice rack! Spring is here! Or at least at Impossibly Alice on Etsy. This weekend, I listed my first spring/summer scarf. Head over there and check it out. This scarf is loose and airy, perfect for wearing in the spring and summer! It is a gorgeous shade of teal. And the best part? 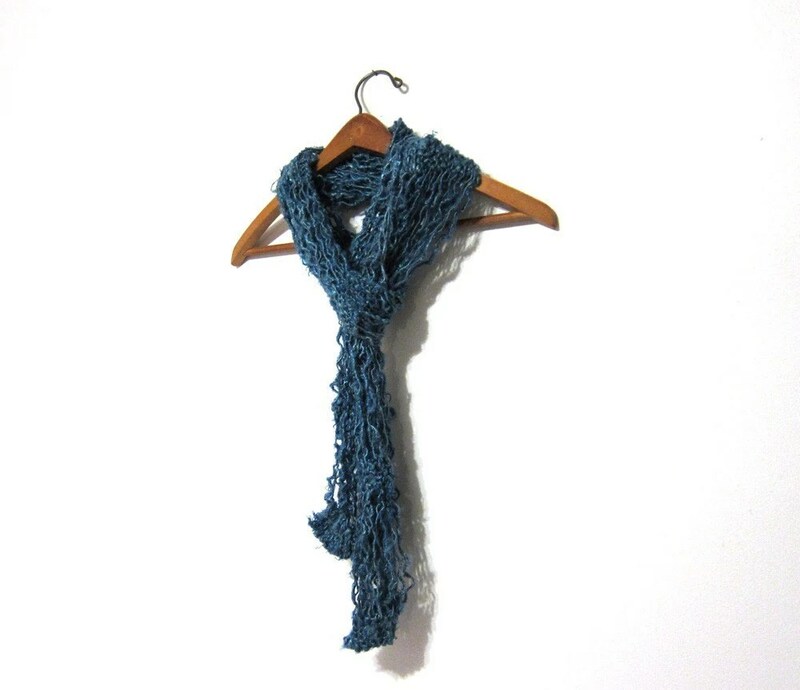 I knit this scarf our of fair trade handspun banana fibre. That means that by wearing it, you are helping women in Nepal work towards a better life for themselves and their families, and you are wearing an eco-friendly renewable resource. This yarn is actually made from harvesting the bark from banana trees. You will not believe how soft and silky it feels. Go and check it out! In the coming weeks, I will be listing more spring and summer scarves in more colours and styles.